In 1976, the towns of Chester, Clinton, Deep River, Essex, Killingworth, Lyme, Old Lyme, and Westbrook united to form Valley Shore Emergency Communications, Inc., a new regional dispatch center to handle their emergency call processing and dispatching needs. These towns already were affiliated through the Valley Shore Mutual Aid Fire Association and Valley Shore Mutual Aid Ambulance Association, and saw the potential advantage of a single answering point and dispatch center for coordination of communications and resources. At the same time, Basic 911 service was starting to be implemented in the area. 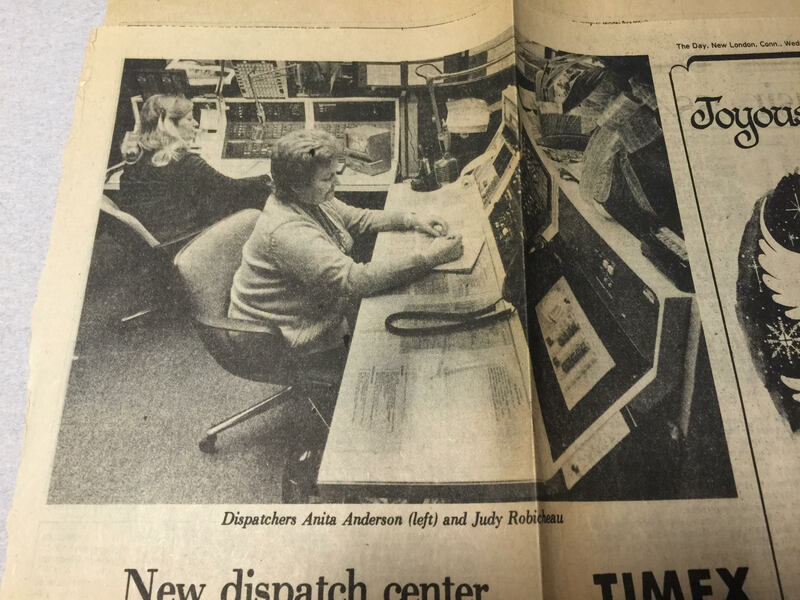 In November of 1980, all but the towns of Clinton and Deep River transferred their call processing and dispatching to the new regional center. The town of Haddam joined Valley Shore in 1986, followed by Durham in 1987. In 1988, the town of Chester switched from Valley Shore to Deep River Control. The town of Middlefield entered the system in 1994, and the towns of Deep River and Chester came on board subsequent to the closing of Deep River Control in 2003. Valley Shore is located at 315 Spencer Plains Road in Westbrook, at the Connecticut State Police Troop F. Operations began on the first floor, adjacent to the State Police dispatch center, in a twelve-by-fifteen room with a two-position console placed in an L-shape. By 1991, having outgrown the original room, operations were moved to a larger basement-level room that was formerly a pistol range. A thirty-three-by-fifteen main dispatch room is flanked by two twelve-by-fifteen offices, one occupied by the director and the other used for administrative support and operations management. In 2005, a major overhaul of the dispatch center was undertaken. A new IPC/Orbacom T5 Radio Console replaced the GE C3 Maestro system, and ergonomically correct Wright-Line furniture took the place of the Skaggs (STS) consoles. The center was completely rewired, from the street in, to resolve fluctuating power issues. New computer hardware supporting our Logistic Systems Computer-Aided Dispatch was also installed. Valley Shore’s administrative staff consists of an Executive Director and an Administrative Assistant. The Director reports to the Board of Directors, a volunteer body comprised of representatives from the Fire and EMS services of the towns that contract with us. An Executive Committee meets monthly to conduct routine business, with quarterly meetings attended by the full Board. The operations staff at the writing of this article, consists of the Communications Supervisor, Senior Telecommunicator, two Telecommunicator Level II’s, and nine Telecommunicator Level I’s. Most of this group are EMT’s, with five trained to the Paramedic level. Many of the staff are also firefighters, with training ranging from Firefighter I to Fire Officer and Instructor. We have found that having field experience helps a telecommunicator to anticipate scenarios and know in advance what will be requested by incident commanders, which can be a significant asset during a major event. Our training program is an extensive in-house program of approximately two-hundred hours, familiarizing the new hire with our specific policies, procedures, equipment, geography, and services with whom we work. During or shortly after this period, depending on State of Connecticut training schedules, the new hire will attend the mandatory eighty-hour Telecommunicator course. Upon completion of this, the last step will be training and certification in Emergency Medical Dispatch, a system that identifies appropriate medical response and provides pre-arrival instructions to those in need. Longevity is a hallmark of Valley Shore, with some staff approaching twenty-five years of service. Competitive wages, benefits, a comfortable and cooperative work environment, and other intangibles create an atmosphere of positive growth and career path movement. Over the past twenty-five years, Valley Shore has been presented with many challenges as expectations of both the emergency caller and the incident responder have grown. We have met many of these challenges with pro-active management and advances in call-handling technologies. We look forward to the next quarter century with optimism and will, as is our way, meet all future challenges with energy and determination.